Q: I am a regular runner and for years, every time I run I leak some urine – this never happens otherwise. Can this be treated? Lucie: Yes. This is much more common than you think. It happens to many women when they jog, do heavy weights, during cross-fit or even when pushing their pram up a hill. It can occur in BOTH women who have and those who haven’t had children. It is usually due to a weakness or a confusion of the bladder. I can help in diagnosing the cause of this and effectively plan how to resolve the issue. Q: I have been doing Pilates for many years, surely that means I have a strong pelvic floor? Lucie: Not necessarily! Like any other muscle in the body, the pelvic floor can become weak, tight, shortened or painful. This can happen for many reasons at any stage of a woman’s life. Women may be training them wrong– there are different types of holding, different durations. Some women don’t realize they are actually pushing down when they think they are contracting them, or they are over contracting them, causing them to become extremely tight and this also causes problems. An assessment can help identify this and teach you the correct way – whether you have been doing it for years or are a newbie. Q: I have a high-risk pregnancy, can I exercise? Lucie: If your obstetrician has given you the all clear (with or without strict instructions) then I can help to teach you or even train with you to participate in exercises that are appropriate for you. 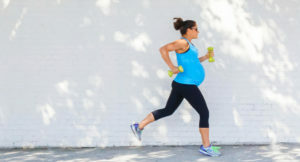 I can help with exercise guidance throughout each trimester and post-natally for those with a ‘high-risk pregnancy or with a ‘regular’ pregnancy. Check out Lucie’s exercise demo for pregnant women.